The links below to other sites are provided for your convenience. The Suisun Resource Conservation District (SRCD) does not control these sites, therefore assumes no liability for their content. We recommend that you review the policies of each website before entering. The Suisun Marsh Plan was completed in 2014, but the implementation will be completed over the next 30 years. 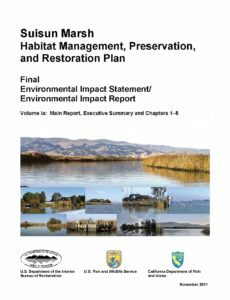 The plan is intended to balance the benefits of tidal wetland restoration and managed wetland enhancements in order to preserve the unique and important ecosystem of Suisun Marsh in a manner responsive to the concerns of stakeholders and private landowners. Bay Area Air Quality Management District (BAAQMD) – The Bay Area Air Quality Management District is committed to achieving clean air to protect public health and the environment in the San Francisco Bay region. California Department of Fish and Wildlife (CDFW) – The California Department of Fish and Game is responsible for the diversified use of fish and wildlife including recreational, commercial, scientific and educational uses. California Department of Water Resources (DWR) – The California Department of Water Resources is responsible for managing and protecting California’s water resources. DWR protects, restores, and enhances the natural and human environment. National Oceanic and Atmospheric National Marine Fisheries Service (NOAA’s NMFS) – A federal agency, a division of the Department of Commerce, responsible for the stewardship of the nation’s living marine resources and their habitat, management, conservation and protection of living marine resources within the United States. NMFS assesses and predicts the status of fish stocks, ensures compliance with fisheries regulations and works to reduce wasteful fishing practices. Under the Marine Mammal Protection Act and the Endangered Species Act, NOAA’s National Marine Fisheries Service recovers protected marine species without unnecessarily impeding economic and recreational opportunities. Rush Ranch is part of the Solano Land Trust and a unit of the NOAA San Francisco Bay National Estuarine Research Reserve. San Francisco Bay Conservation Development Commission (BCDC) – The Bay Conservation and Development Commission is the federally-designated State coastal management agency for the San Francisco Bay segment of the California coastal zone. BCDC is dedicated to the protection and enhancement of San Francisco Bay and to the encouragement of the Bay’s responsible use. 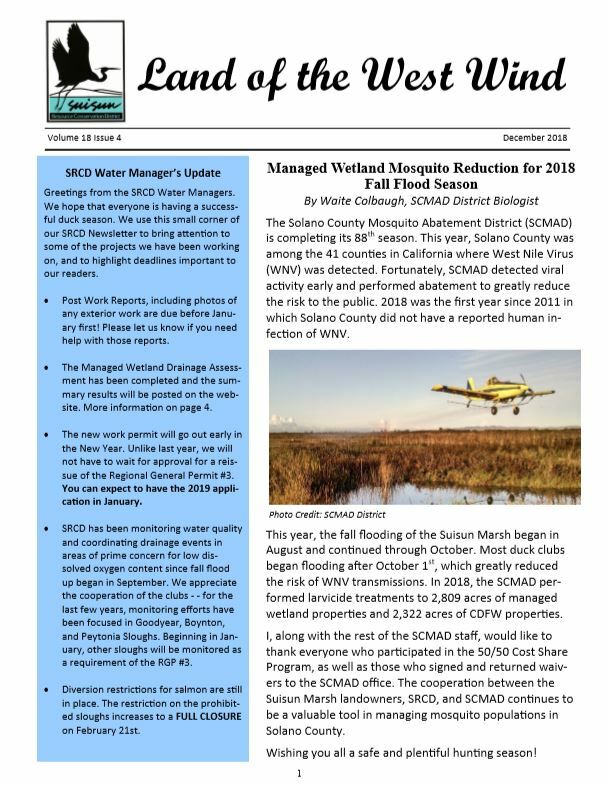 Solano County Mosquito Abatement District – The Solano County Mosquito Abatement District (SCMAD) is a special district responsible for mosquito abatement throughout the incorporated and unincorporated areas of Solano County, which covers 829 square miles. Suisun Marsh Charter Agency – representatives with primary responsibility for actions in Suisun Marsh formed a Charter Group to develop an implementation plan for Suisun Marsh that would protect and enhance Pacific Flyway and existing wildlife values, endangered species, and water-project supply quality. U.S Army Corps of Engineers (USACE) – The USACE’s San Francisco District was established in 1866, to administer the laws to protect and preserve the waters of the U.S., regulate construction in navigable waters, and placement of fill in wetlands. Our primary goal is to administer the law in the public interest while protecting the aquatic environment from unnecessary harm. U.S Bureau of Reclamation (USBR) – Mid Pacific Region strives to develop and implement a balanced approach to water allocation, serving users while protecting the environment. U.S. Geological Survey (USGS) – Home page of the U.S. Geological Survey, the science bureau for the Department of Interior. This site contains links to groups working in Suisun Marsh including the USGS Western Ecological Research Center and the California Water Science Center in Sacramento. California Waterfowl Association (CWA) – Nonprofit conservation organization whose mission is to preserve and enhance California’s waterfowl, wetlands and outdoor heritage. Ducks Unlimited (DU) – Conserves, restores, and manages wetlands and associated habitats for North America’s waterfowl. Rush Ranch is part of the Solano Land Trust and a unit of the NOAA San Francisco Bay National Estuarine Research Reserve. About Special Districts – Descriptions of Special Districts and their Roles in California as Local Service Providers. California Special Districts Mapping Program – Comprehensive and interactive online map of special districts in the state. 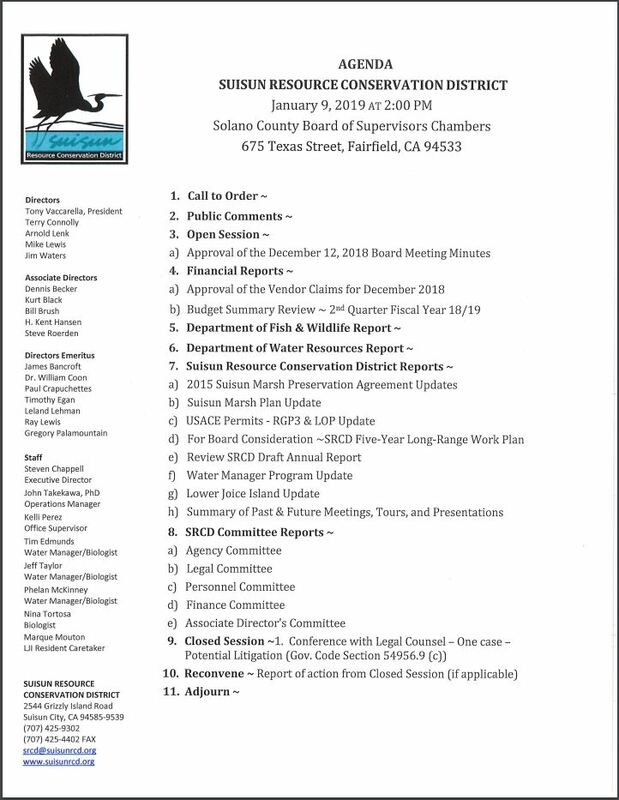 Solano Resource Conservation District – A non-regulatory special district to the State of California that works on watersheds. Dixon Resource Conservation District – The Dixon RCD was originally formed to construct, operate, and maintain the Dixon Drain. The Drain is a 70-mile long system of ditches designed to prevent or alleviate the flooding of agricultural lands.